A .NET developer can use WMI to obtain information about drivers installed on the client machine, verify whether the system is licensed or not, check for hardware information of each and every deveice and a lot more. 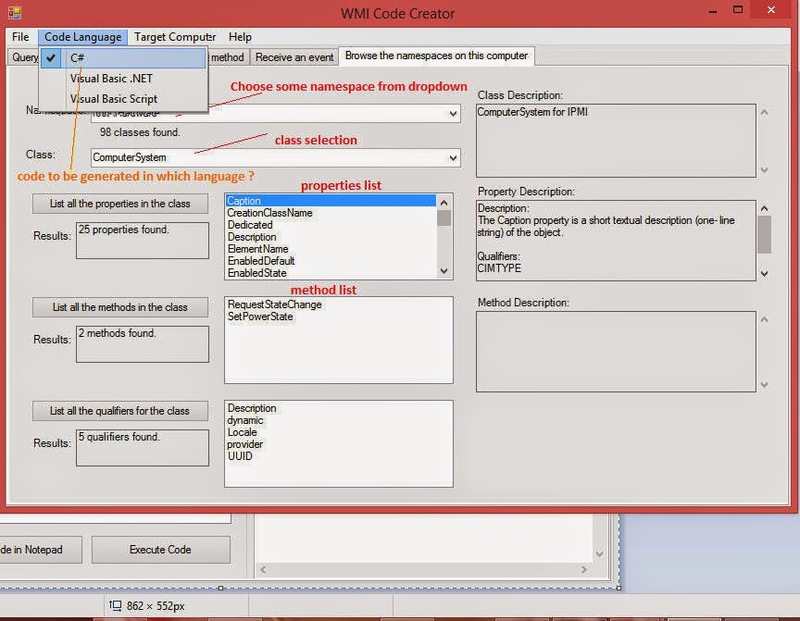 WMI is a very powerfull tool, and once you know how to get what you need, it can be invaluable as a time saver. When developing Windows applications, developers often need information a system, either local or remote, that although commonplace, can be very tough to get. There is using the remote registry, but I myself do not allow remote registry access as do many network admins. WMI is usually wide open on networks, assuming you have the required rights to query it . 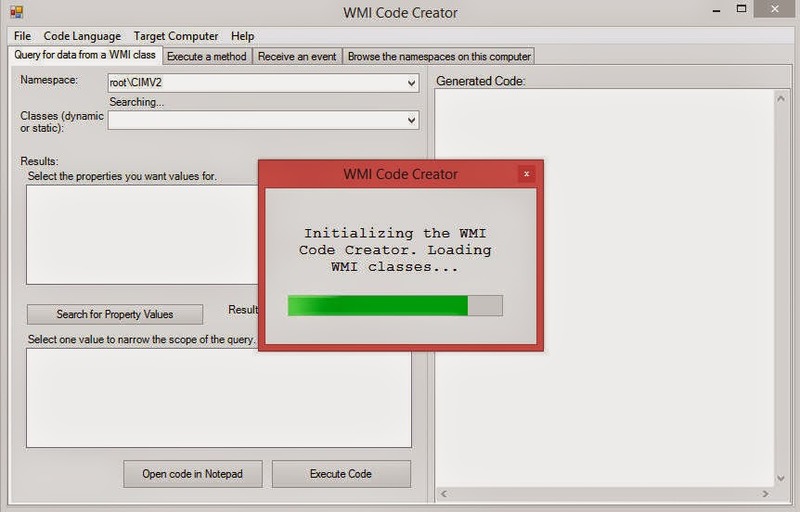 The purpose of WMI is to present a uniform interface to any local or remote applications or scripts that need to access management data from a computer system, network or application. Thanks to WMI, programs do not have to talk to a wide variety of operating system APIs which can be particularly inconvenient for scripting languages. 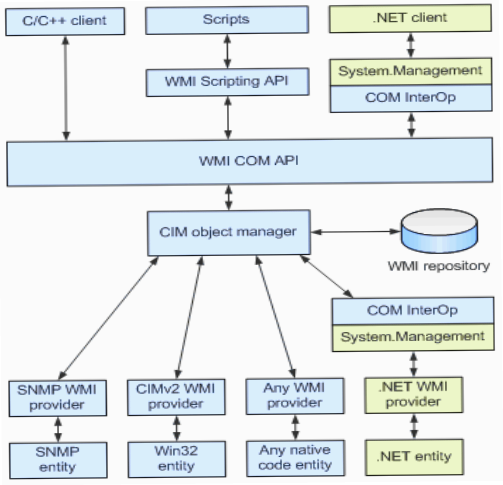 All WMI interfaces are based on the Component Object Model (COM), however it is possible to access WMI from .NET thanks to the COM Inter-Op mechanism, as our diagram shows. Managed objects and providers: A WMI provider is a COM object that monitors one or more managed objects for WMI. Like a driver, a provider extracts WMI data from a managed object and is responsible for passing messages from WMI back to the managed object. WMI infrastructure: As a Windows component WMI consists of the Windows Management service, which includes the WMI Core, and the WMI repository. The service acts as an intermediary between the providers and the repository. Only static data about objects, such as the classes defined by the providers, are stored in the repository. Management applications and scripts: A management application queries management information either by calling the COM API for WMI or through the Scripting API for WMI. As you can see, constructing a simple WMI query is quite easy. To get results, you need and interface, and in .Net it is provided by the System.Management namespace. To make it work all you need is a query, and a little bit of code, just as if you were querying a database. WMI Provider is a software component that functions as a mediator between the CIM Object Manager and managed objects. By using the WMI APIs, providers supply the CIM Object Manager with data from managed objects, handle requests on behalf of management applications, and generate event notifications.